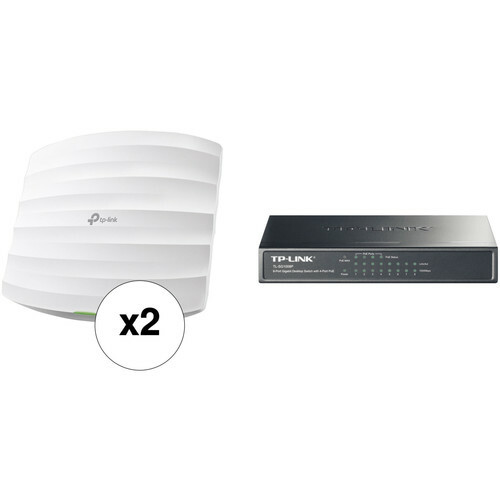 This B&H Kit includes the TP-Link EAP225 AC1350 Wireless Dual-Band Gigabit Ceiling-Mount Access Point and the TP-Link TL-SF1008P 8-Port 10/100 Mb/s Desktop Switch with 4-Port PoE. The included access point not only connects to the TL-SF1008P switche's Ethernet port, it also derives its power from the switch, eliminating the need to run a dedicated power supply to the AP. Once installed, this dual-band access point supports the 802.11ac Wi-Fi network standard, providing data transfer rates of up to 1350 Mb/s. The EAP225 AC1350 Wireless Dual-Band Gigabit Ceiling Mount Access Point from TP-Link lets you extend your wireless network's coverage throughout the office. It has a low profile, easy mount design, which lets you install it on the ceiling or onto a wall. Featuring dual-band 802.11ac connectivity, you'll be able to transfer data at speeds of up to 867 Mb/s on the 5 GHz band and 450 Mb/s on the 2.4 GHz band. This device is PoE-compatible and can be used together with the EAP Controller Software to manage connected devices and guest access. The TP-Link TL-SG1008P Gigabit Desktop Switch is an eight 10/100/1000 Mb/s port unmanaged switch that requires no configuration and provides 4 PoE (Power over Ethernet) ports. It can automatically detect and supply power with all IEEE 802.3af compliant PDs (Powered Devices). In this situation, the electrical power is transmitted along with data in one single cable, allowing you to expand your network to where there are no power lines or outlets, where you wish to connect devices such as APs, IP cameras, IP phones, and more. Four of the 8 auto-negotiation RJ-45 ports (port 1 to port 4) of the switch support PoE (Power over Ethernet) function. These PoE ports can automatically detect and supply power with the IEEE 802.3af compliant PDs (Powered Devices). Supports PoE power up to 15.4W for each PoE port, a total of up to 53W for all PoE ports, and supports priority function to protect the system when the system power is overloaded. Features priority function which will help protect the system when the system power is overloaded. If all PoE PDs power consumption is 53W a priority will be arranged among the PoE ports, and then the system will cut of the power of the lowest-priority port. Priority (port 1 > port 2 > port 3 > port 4): This function will help protect the system if the system power becomes overloaded. For example, Port 1, 2, and 4 are using 15.4W (maximum power per port is 15.4W), the system power is 46.2W in total (PoE max LED is red). If there is an additional PD inserted to port 3 with 10W, then the system will cut of port 4 to protect the system, this means ports 1 and 2 will use 15.4W, and port 3 will use 10W, and no power will be supplied to port 4. Features Auto-MDI/MDIX, auto-negotiation, store and forward, IEEE 802.3x flow control for Full-duplex Mode, back pressure for half-duplex mode, and 8K MAC address auto-learning and auto-aging. It requires no configuration and installation. With desktop design, outstanding performance, and quality, this switch is a great selection for expanding your home or office network. It has a plug-and-play and fanless design. Supports flow control, back pressure, and fanless operation. Box Dimensions (LxWxH) 16.3 x 13.45 x 2.65"
Box Dimensions (LxWxH) 11.0 x 8.9 x 2.6"